Comments: Rampage was a Marvel UK title that predominately reprinted US Marvel comics. 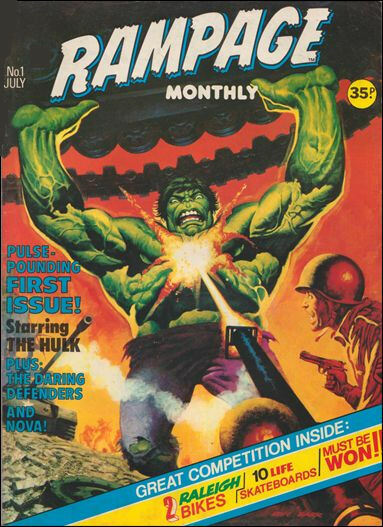 Sharing the name of a previous, weekly reprint title, Rampage's lead story was initially the Hulk, reprinted from the American magazine Rampaging Hulk, but with issue #8 the X-Men began with the first UK printing of the "All-New" X-Men who had debuted in Giant-Size X-Men #1, and they soon became the lead strip. Circa Rampage #40, the title featured some UK originated strips, with Paul Neary's Timesmasher in #40, 42-44, and Alan Davis' Crusader in #41. Blockbuster was merged into Rampage as of Rampage #45, though the only Blockbuster strip to survive the merger was the Iron Fist reprint. Rampage's final issue was #54; a month later it officially merged with Marvel Super-Heroes, with two strips transferring over - X-Men and Iron Fist - as of Marvel Super-Heroes #392.